A lot of people ask what BBG stands for, especially those who are new to the workout or have never heard of it before. And while the workout is intended to stand for “bikini body guide,” I really think it stands for BADASS BABES & GUYS! 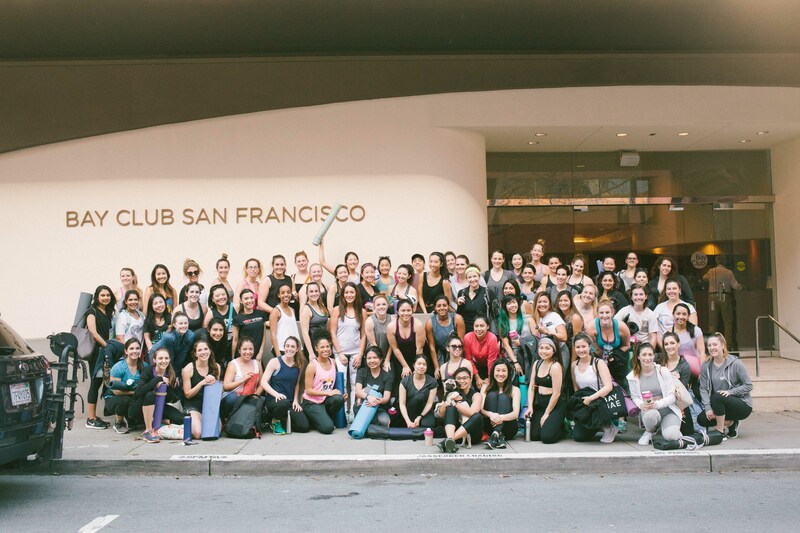 Because over 100 of us got together, killed our workout, and fostered a great sense of community that only burpees and a whole lot of sweat can bring! The workout was held again at the beautiful Bay Club gymnasium, and we had so much fun with a circuit workout that included push-ups, burpees, squats, mountain climbers, and a whole lot of fun! The day’s workout was created by Mickaela Roxas of Plants and Planks, and she took the best of Kayla Itsines’ exercises from her Sweat app, and compiled them into a full body workout. We had a great time working out together! Special thank you to Women’s Best for sponsoring protein powder, shakers, and goodies (cookies, chocolates, wafers, BCAA’s, protein creme, and more) for our attendees! They generously provided all of this workout fuel for 100 attendees to keep us motivated and going strong! Their protein powder and BCAA’s are the only supplements I am currently taking, and I would recommend them for everyone! We are so grateful to have them as a sponsor, and I’m so happy that our attendees got to try the products. Also thank you to Bay Club San Francisco for their generous hospitality. For those of you who haven’t tried out the club and are local to the SF Bay Area, you totally should! It’s currently my gym (I’m a member) – and I would love to work out with you there! Also, you can join our Facebook group here, where you can download a free 3-day pass to try out the gym. The gym amenities are beautiful, including a luxurious locker room, weight room, multiple cardio rooms, as well as yoga and pilates! Also thank you to Elizabeth Griffin for being our official event photographer! Here are some of the photos from the event! Click here for the full album! Also thank you to Jeremy Wong of Where’s the Film Productions for the amazing video footage! If you are interested in being notified of future events, you can head over to http://sweatsf.com/ and sign up for the mailing list! We hope you all had fun sweating with us!